You arrive early to get along the flight line fence. Stake out your spot and begin getting to know your neighbors for the next 6-8 hours. There for the same reasons I am and that is the love of aviation photography both old and new. I personally have a soft spot for the warbirds. Especially the ones that are veterans and have seen action. I can remember my Dad teaching me the finer points of the warbirds when we went to the airshows. He would point out the specs, speed and what theater they fought in. My dad loved history and growing up as little boy during the war, he had a special fascination with the planes. He actually wanted to be a pilot, much to my grandmothers dismay, but a 6 feet 5 inches, he could not squeeze himself into the cockpit. His life took a different direction, but he never lost his love of aviation. 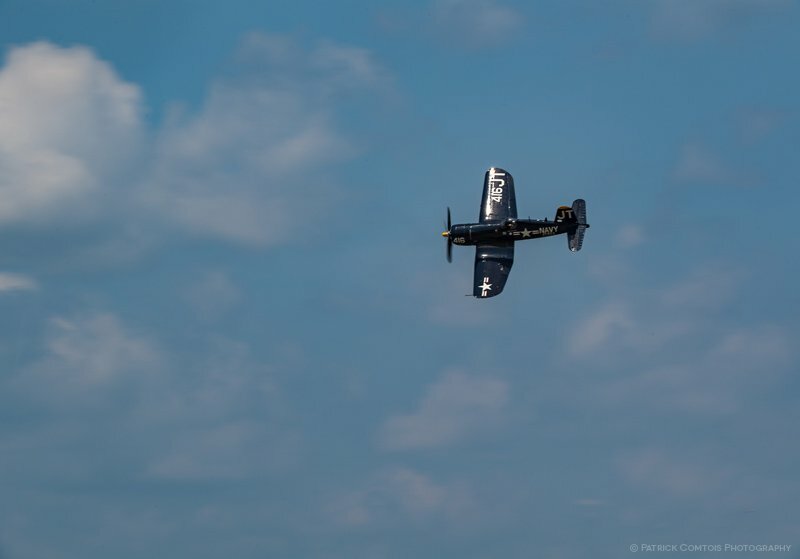 He certainly passed on his love of aviation to me and I never turn down a chance to go to an airshow. Not just for the history, but for the photography. This beautiful F4U was built by Vought with the Bureau Number 97143, registration N713JT and manufactured in August of 1945. The aircraft has a legendary history. She served two tours on two different carriers and has the distinction of flying over 200 combat missions. December through May of 1951, she served aboard the USS Valley Forge as part of VF653 Naval Reserve Squadron from Akron, Ohio. She served aboard the USS Boxer as part of the squadron known as the “Bitter Birds” (VF884 Naval Reserve Squadron from Olathe, Kansas) from June-October, 1951. The “Bitter Birds” flew 1519 missions in Korea, dropping 750,000 pounds of bombs and firing 3800 rockets and also 1.4 million pounds of ammunition. The fighting did take its terrible toll. Eight pilots of VF884 were killed or listed as missing in action, including the squadron’s skipper . Following the time in the Korean War, the aircraft served as part of the Honduran Air Force from 1960 to 1970. In 1970 she was sold to an American Airline pilot and brought to the USA. It currently is owned and operated by pilot Jim Tobul who restored her to airworthiness in 1991. 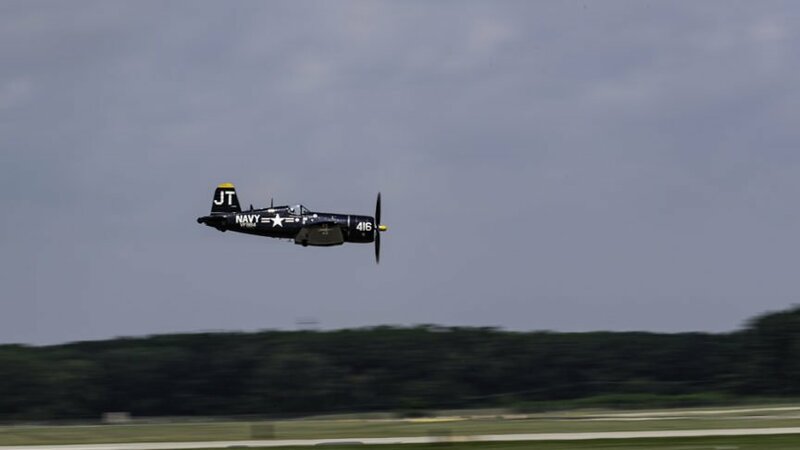 My favorite was always the formidable P51 Mustang. I can recall trying to hang these planes from my ceiling with fishing line trying to make it look like it was diving on an enemy fighter. Seeing these historic aircraft really gets my heart pumping. This P-51 is a celebration of our nation’s armed forces. Every aspect of the paint represents those who have served, and those who gave the ultimate sacrifice. The black cape covering the front of the aircraft represents the veil of protection that our armed forces give us. That veil is one of the reasons why we have what we have today, freedom. As the cape extends to the back of the canopy, it spreads out and divides into feathers, symbolizing the eagle that has flown with every aviator since the birth of aviation in 1903. The black paint has tiny sparkling stars in it, each sparkle represents an American Veteran that served our great country; the unsung stars in our lives. These veterans are the glimmering star in a mother’s eye, a wife or husband’s heart, a son or daughter’s hope for the future. The silver ring behind the spinner represents the shinning halo of the guardian angel who guides service personnel, having given the ultimate sacrifice, to their final resting place. 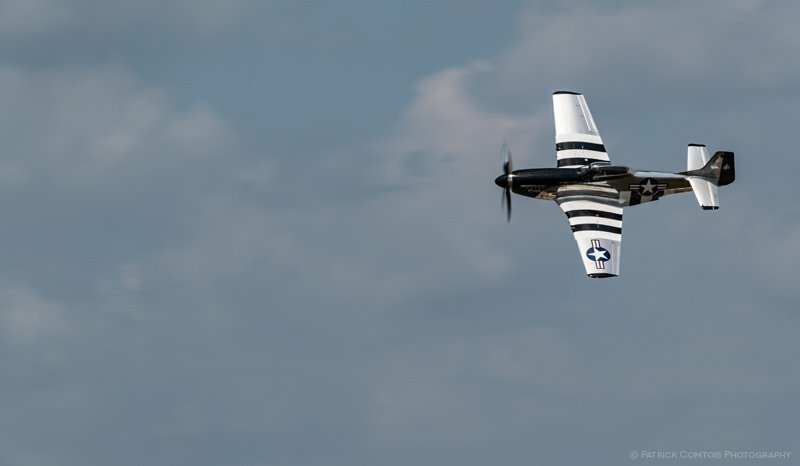 The black and white stripes on the wings are there, as they were on all allied aircraft on D-day. The stars and bars, proudly displayed, represent the armed forces symbol that all United States fighter planes carry. It carries the post war version because “Quick Silver” was never a part of a unit till after World War 2. 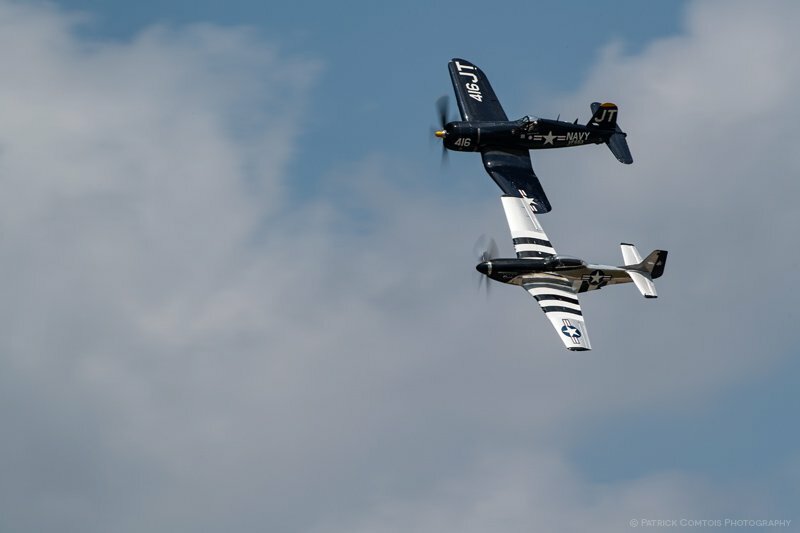 Hearing and seeing these 2 historic aircraft together in the sky never gets old for me and I hear the pratt & Whitney engine along with that famous Rolls Royce Merlin engine, I cannot help but ponder the men who flew these aircraft against overwhelming odds to grant us our freedoms. God Bless America!